The Prolific Works app makes ebook delivery faster and simpler for anyone who uses our site. Books claimed on the Prolific Works site can be moved from the Prolific Works app to any ereader app currently installed on your device, and can be sent to your Kindle as well. This support article will give you detailed instructions on how to download ebook files from the Prolific Works app to your Kindle app or Kindle device. 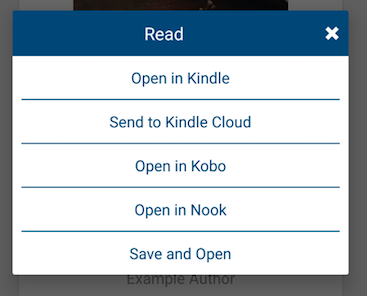 After you select the "Read" button on the page of the book you would like to read, a menu with up to five options (“Open in Kindle,” "Send to Kindle Cloud," "Open in Kobo," "Open in Nook," or “Save and Open”) will appear (you will only see options for apps that are installed on your mobile device). Note: if you are using an iOS device, you will only see "Read in Kindle" and "Save and Open." 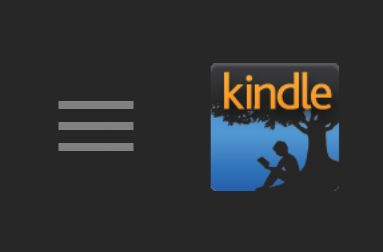 Select "Read in Kindle," and you will see "Copy to Kindle" in the menu that pops up along the bottom of the screen. Select "Open in Kindle." 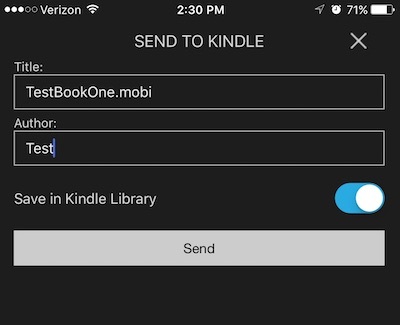 Selecting "Open in Kindle" will automatically launch the Kindle app. You should see your selected book on the Kindle Home screen. Note: If your book doesn't appear in your Kindle library after a few minutes, you may need to enable Data Storage Access on your Kindle app. To enable Data Storage Access on your Kindle app, select the menu item at the top of the screen. Scroll down until you see "Settings." Select "Settings" and scroll down until you see "Data Storage Access." Check the box to enable Data Storage Access for your Kindle app. This is the "Data Storage Access" section when Data Storage Access is disabled. This is the "Data Storage Access" section when Data Storage Access is enabled. Select the menu item at the top of the screen. 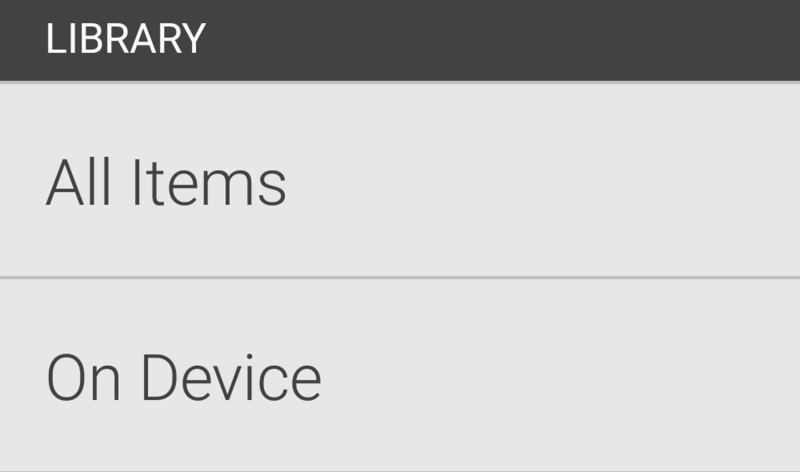 Look in both the "All Items" and "On Device" sections for your book. If you don't see your book in either section, restart the Kindle app. After you select the "Read" button on the page of the book you would like to read, a menu with up to five options (“Open in Kindle,” "Send to Kindle Cloud," "Open in Kobo," "Open in Nook," and/or “Save and Open”) will appear (you will only see options for apps that are installed on your mobile device). Click on "Send to Kindle Cloud," and you will be brought to a new Send to Kindle page. Check the boxes next to the devices you want your book sent to. If you would like the book saved to your Amazon Kindle Library Archive, make sure the box next to "Archive in your Kindle Library" is checked at the bottom as well. Then click "Send." Note: The author's name is changed to your name in this screen, so you will need to edit that field before sending it to your Kindle. 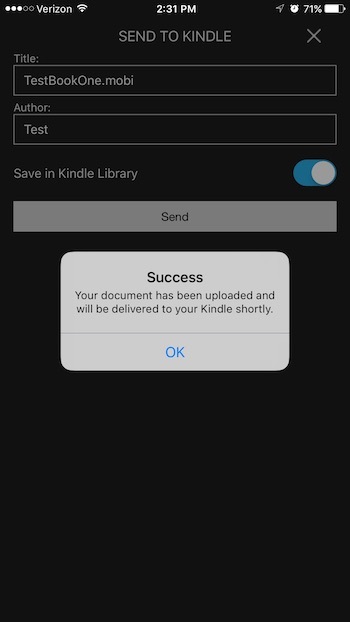 You should get a message saying that your file was successfully sent to Kindle. The book should appear in your Kindle library after a few minutes. If it doesn’t, select “Sync & Check for Items” and check if your book has arrived. This may take a few minutes. If you have a Kindle Fire, the book might be found in the “Docs” section, and the cover may not appear until you have opened the book. 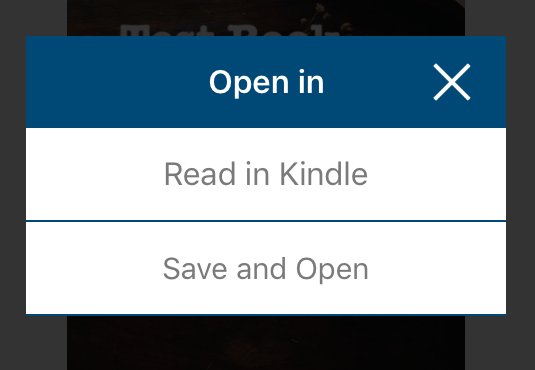 After you select the "Read" button on the page of the book you would like to read, a menu with up to two options (“Open in Kindle,” and/or “Save and Open”) will appear. To send to your Kindle device, you can select either option, and a menu will pop up along the bottom of your screen. Select the option "Send to Kindle." Note: make sure you're choosing "Send to Kindle," NOT "Copy to Kindle." You will be brought to a new Send to Kindle page. 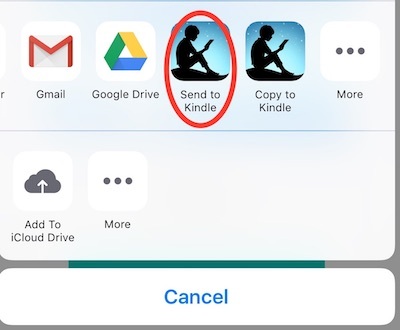 You should get a message saying that your file was successfully sent to Kindle. The book should appear in your Kindle library after a few minutes. If it doesn’t, select “Sync & Check for Items” and check if your book has arrived. This may take a few minutes. If you have a Kindle Fire, the book might be found in the “Docs” section, and the cover may not appear until you have opened the book.